This is a season for me when I’m noticing pain and suffering. My Dad is in the end stages of Parkinson’s, a dear friend’s pain and suffering with cancer ended yesterday, another friend is struggling with congestive heart failure in the hospital, another friend is sitting beside her father’s bed who is dying… it seems that most places I look, there is pain. And this morning the following devotional was sitting in my email waiting for me to read it. There ARE good things that come from pain. Be blessed my friends! There are good things that come from pain. And there are good things that only come from pain. Sometimes I hate that this is the human experience but we all know it’s true. We can tell our kids a hundred times it will hurt if they touch a hot stove but it’s only when they get their chubby finger too close and we’re madly running cold water over it that they really understand. As painful as Dan’s death has been, there has been good that has come from it. I understand things now I know only because of the pain and all that it brought. One of those is true peace. Only when we were in the storm of our life, did I really understand peace. Before, I thought peace happened when everything was running smoothly. I thought peace was the quiet that comes after all the kids are down for the night or the waveless routine that came with a well-ordered life. But those things are really calm and calm is not the same thing as peace. True peace comes even when things don’t run smoothly. Peace doesn’t happen after the storm, when you look around and realize Hey, we made it through. We’re still standing. True peace happens right in the midst of the storm. It’s not that peace ignores the storm or walls itself off to all of the pain. When Dan died, the pain was raw and real, the grief I felt for my children absolutely gut-wrenching. I had real fears and there have been real consequences every single day without a husband and a dad. So peace doesn’t sugarcoat the circumstances. Instead, peace comes because God is present right in the midst of the hard. It comes when I give Him my fears and my questions and my pain and I receive His assurance and promise and hope. Peace comes when I trust God; when I fill up daily on the life He breathes right into the hard. It’s not that the waves stop crashing – they are still there. But they don’t drag me down with them because the hope and promise and Presence is stronger. It is so not pie in the sky. It’s not a platitude or wishful thinking. Replace the lies of my fear with the truth of God’s promises. Remember how God has been faithful every single time before. Release control of my circumstances and my fretting to God. Realize that God’s character can only ever be Love and Faithfulness and Good. Peace comes because God has taken my hand in His and is madly pouring the water of His life over my hurt. Not the Lord will bring peace. Not the Lord will show me peace. 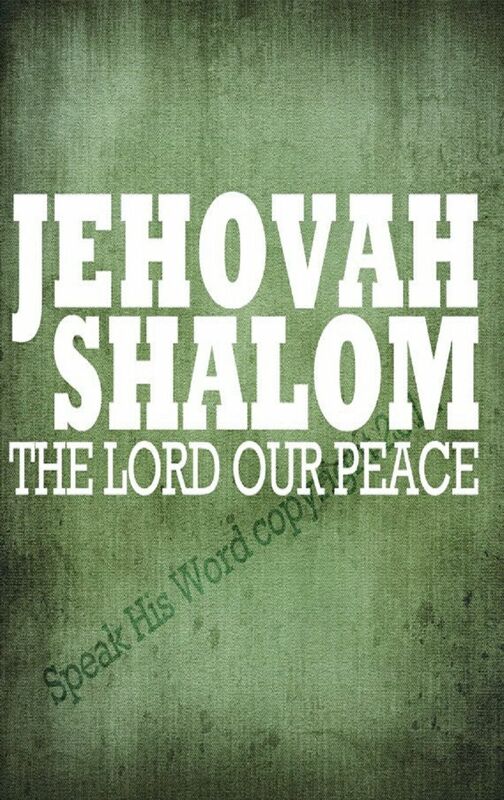 The Lord IS peace. Jehovah Shalom. I hate the storm that has left our family missing a father and a husband. I hate the storms that I see rocking some of my friends and family. But I wouldn’t want to give back the good that has come. I know Jehovah Shalom in a way I never knew him before. There are some things – good things — that only come when you’ve endured a storm.